For chipless cutting of two sided melamine, vinyl, polyester, and kortron. Recommended for thin, low pressure, two-sided laminates and veneer plywood. For thin veneers on flakeboard - fire-retardant, laminated (1 or 2 sides), masonite, fiber board, lumbercore, glue-ups, hard/soft woods and chemically impregnated wood. 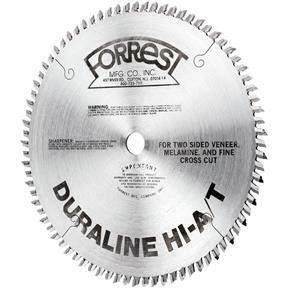 Duraline Hi-A/T advantages: Eliminates need for a small scoring saw blade on table saw work. The 40º points slice through thin bottom layers with no tears or chips. 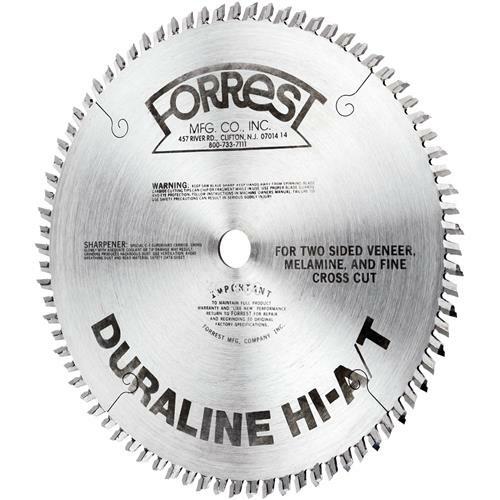 Made with double-hard C-4 submicron carbide for longer life between sharpenings.